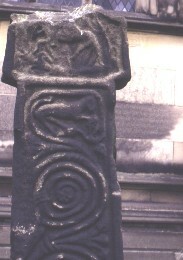 East Cross, east view, upper half. In the churchyard at Bakewell. 8' high, by 21'' wide, and 15'' thick. This cross is dated to the late eighth century. The wide panel at the top of the shaft has a scene which is thought to be the entry of Christ into Jerusalem (?) by some commentators (New Testament, Matt 21:1; Mark 11:7; Luke 19:35; John 12:14). Below this scene there is vine-scroll with a little animal at the top, and this fills the lower part of the shaft. The fruit of the vine is a cluster of berries, and the vine-scroll is single and unrolled in massive spirals.